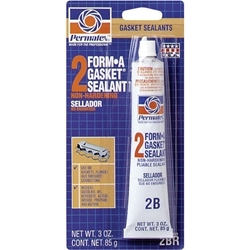 Slow-drying, non-hardening sealant designed for sealing cut gaskets and stamped parts. Allows for easy disassembly if required. Temperature range -65°F to 400°F (-54°C to 204°C); resists common shop fluids and fuels. Use where sealing is more important than adhesion.